The Sisterhood of World Bloggers Award! So the Sisterhood of the World Bloggers Award is an award that recognizes the unique voices of women across the world. Which makes you feel pretty awesome to be nominated for, right? 1. Did you have a book that meant a lot to you as a child? I can’t really think of a specific book, but i was a big fan of Jacqueline Wilson who was my inspiration at the time. I think I read pretty much all her books as a child. I also loved Jeremy Strong! 2. Is there any author or book that you collect and will always welcome multiple editions of the same title? 3. Say that you find yourself judging a book by its cover (not that we ever do that! ); what sort of covers do you go for? Are there any that are an absolute turn off? I find simple covers so gripping, i fall for their clarity. Book covers are so important! I hate book covers that literally look like they were made using wordart or something. That really irritates me. And i’m not a massive fan of faces on book covers either. 4. If you could pick any imaginary animal to bring home to Mum with an earnest, “Can we keep him? ?”, what animal would it be? An ostrich with human teeth counts as imaginary, right? 5. Is there any book to movie adaptation that you simply refuse to watch? No way, you’re not even giving them the opportunity to mess it up. So that’s it from me! So sorry that I’m only able to do 5 questions guys. since i should be studying so much right now. Posted on May 4, 2015 May 10, 2015 by manyreads	This entry was posted in Uncategorized. Bookmark the permalink. Right? And you really do! I’m sure you’ll love it, I’ll Give You the Sun is such a great book! Ha ha same here I have a bunch of studying to do yet here I am checking out a blog. 😉 Thank you for the nomination! You described it much better than i did! That’s exactly what i was trying to say! 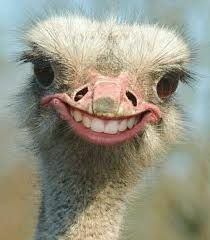 The ostrich with human teeth is kind of cute in a completely weird way, haha. Its cute, weird and makes me giggle every time, haha. Its so strange to see it with human teeth. No problem Trisha Ann! Ikr! It’s so funny and strange to see any animal with human teeth haha.